This is not a consequence of being idle; on the contrary, I’m quite busy. I participated in National Novel Writing Month for the third year in a row. While I didn’t score a ‘win’ by logging 50,000 words in the 30 days of November, I’m off to a solid start on a new book that I feel is promising, and I’ve continued to write nearly every day since starting that challenge. I’m also devoting time to game design, though not as intensely as in the near past. It is also the holiday season, and it’s raining an apocalyptic amount in Portland right now. The grey cloak of Winter has settled over the Pacific Northwest and I’m motivated mostly by the need to achieve something, to get this literary career started before I smother beneath the frustration I pile upon myself year after year. Nothing matters so much to me right now than finishing something and having it published … if only to prove I was right all along, that this was what I was meant to do. I’ve curtailed most of my social activities of late. None of the old amusements please me anymore. I don’t want to be entertained or distracted; I want to feel fulfilled. It’s a tall order, I admit. So, what is the purpose of this blog then? I tell myself I should continue to communicate my mind’s inner workings to the privileged few who know of my web site’s existence. But, like everything else I’ve excised from my life, this too seems like a distraction. My posts are read mostly by those who know me and could well find out these details in other ways. So, perhaps I’ll post a random thought or example of my toil here for general consumption. But don’t expect much. Multitools are great. The fewer things you have to carry, the freer you are to move about and do the kind of work you do wherever you do it best. I carry a Leatherman all the time: it comes in handy quite often for the occasional repair. But, my kind of work is creative in nature, so a creative multitool is what I need. Artists are often required to have at their disposal a wide variety of tools: the visual artist needs pencils, pens, brushes, paper and canvas; a writer needs notebooks, a keyboard, reference materials; musicians require instruments. Needing to carry fewer tools means an artist can leave the confines of the studio. My creative multitool is an iPad. I’ve used an iPad for web surfing, playing games, watching video and other leisure activities for a couple years now, but it has only recently become my primary implement for writing, design, drawing and other creative expression. A good Bluetooth keyboard makes an iPad perfectly adequate for simple, plaintext typing, which is the kind I do. (Fully featured word processing, à la Microsoft Word, is harder to do on the small screen.) I use one that doubles as a stand and triples as a magnetic cover, giving my iPad the form factor of a small netbook. I recently bought the Adonit Touch Pro Bluetooth stylus, which enhances drawing with pressure sensitivity and palm detection. It turns the iPad into a pretty good portable digital drawing platform. iDraw: my go-to vector design app. I use it for all my game pieces and boards. Procreate: a nice digital painting app with enough tools to work in most styles. It doesn’t try to reproduce every natural medium, and has some great options for comic artists. Concepts: a bridge between vector and natural media drawing. It converts paint strokes to vectors. iWriter: a good, cloud-backed, no-frills word processor. Its minimalist interface reduces distraction and lets me focus on the words. Scripts Pro: the best app for writing in screenplay format. I use it for comic scripts. VoodooPad: a wiki-style note taking app. The iOS version is very bare-bones (no rich text), but it syncs with my Dropbox files, and the full app (on Mac) has a rich variety of scripting, formatting and export options. Because it now supports MultiMarkdown, I can create new pages in plaintext and import from other apps without headaches. Dropbox: where I keep all my workfiles. I like it because it’s ubiquitous and supports versioning, in case I overwrite something import (it’s happened). It also lets me access my files from any device. Evernote: my go-to notes and scanning app. I’m in the process of digitizing all my paper notes, and Evernote’s handwriting recognition makes then searchable. I tend to outline ideas in long lists, and Evernote makes it easy to edit and organize them. Sheets: for tabular information. Some data is easier to parse as a table. Tabletop and Garageband: for the occasional musical experimentation. It can be fun and therapeutic to exercise the musical side of the brain. Sometimes I get a tune caught in my head, and one way to free up mental bandwidth is to bang it out on a virtual keyboard. This is not to say my multitool is perfect. I’m still looking for a good 3D modeling app for iOS; at some point, I’d like to work on some designs for space vessels I’ve dreamt up. Blender hasn’t made it to iOS yet, and all the tools I’ve found so far are pretty primitive and gear mostly toward the 3D printing market. Add to all this stuff Gmail, Facebook, Flipboard, HBO Go, Netflix, Kindle, and dozens of good games, and it’s kind of scary how important to my daily life this device has become. But with all the potential at my (literal) fingertips, one thing in shorter and shorter supply is excuses not to be creative. Which is a good thing, because it’s mostly what keeps me sane at this point. It takes discipline to write. It takes discipline to get up at 5:30 every morning and run several miles. It takes discipline to do both every day before work. This is how I’ve been living the last four days. The result? A couple thousand words worth of short story (still in progress), more energy at the beginning and in the middle of the day (yay! ), and a lot more fatigue at the end of the day (zzzzzz). Is this the spark I needed to reignite my creative fire? Maybe. I do feel more alert, have better mental focus, and find my mind returning to a state where it teems with ideas and eagerness to work on things. I’ll have to sustain this schedule somehow. The exercise is obviously the genesis of my increased energy, but I need to sleep with equal vigor or my brain will simply short out again and take the rest of me with it. I found a way to convert a mass of ancient digital files in obsolete formats (Claris Works?) to plain text, rendering them useable again. Some of these, I haven’t read in 15 years, and I’m amazed at times how inventive and weird I was in the past. I’ve ordered a fancy new Bluetooth stylus for the iPad—one with pressure sensitivity and palm detection—so I can give digital painting a whirl. Maybe this is what gets me back into drawing comics. Digital subscriptions (via Amazon’s Kindle app) to speculative fiction magazines such as Science Fiction & Fantasy, Lightspeed, Clarkesworld, and Asimov’s Science Fiction are quite inexpensive: anywhere from $2-$4 a month. I grabbed a handful so I can fill my brain with a steady supply of inspiration. Scanning my old physical notes—of which I have reams and reams—has been made easier than ever by Evernote, which also makes them searchable. So, I have fewer excuses than ever to not be making things. The trick is to have the energy to keep moving, both figuratively and literally. It’s a Friday, and it’s been a long week. I look forward to a good night’s sleep and a productive weekend. ‘Tis a tale of technology and woe. Though I have been a lifelong user of Apple’s products, I still find myself confounded and frustrated by their shortcomings. For this rant, I isolate iTunes, in particular, for scorn. A upgraded my iPad a couple months ago and have enjoyed using a faster and more powerful device. I often use it for note taking or other writing, so I have magnetic cover that doubles as a Bluetooth keyboard. I bought one for the previous iPad and it worked marvelously, so equipping the new tablet with a similar accessory was an easy decision. Happy to have found a potential solution, I opened my iPad last night and tapped on the “upgrade” button. iOS 9 installed, the iPad rebooted, then roughly 25% of my apps (including the drawing app I use to design my games) were greyed out and unusable. Rebooting the iPad did not correct the problem. I ended up having to delete and re-install the apps. I discovered to my horror that reinstalling iDraw erased my fonts and shape libraries (I had assumed they were stored in iCloud like the art files themselves). I plugged the iPad in to my MacBook to see if I had a recent backup for it. I did not. I could restore the device from a backup from the previous iPad, but it would be missing everything I’ve added since then. In the end, I decided to simply transfer some eBooks and PDFs to the iPad. Syncing, of course, resulted in deleted apps reappearing. I deleted the apps and, while I was trying to unmount the device, iTunes tried to sync again. I decided I’ll just re-install the missing fonts and rebuild my shape libraries because I don’t want iTunes to touch my devices anymore. It’s gone insane. When it came out alongside the original iPod in 2001, iTunes was a swift, light little media player. It’s grown into a cancer-ridden monstrosity: a crufty piece of bloatware that’s trying to play your music, manage your playlists, sell you more music, play/sell/rent videos, sync your mobile devices, stream, make you omelets, babysit the kids … just kill it already, Apple! Cut iTunes into its constituent parts and start over, because the poor application just doesn’t know what it’s supposed to be doing anymore. About ten years ago, an eternity in Internet Time™, I tried my hand at drawing some web comics. While most were of a satirical nature, poking fun at such diverse topics as superheroes and Medieval tapestries, in one case I attempted the daunting (at least for me) challenge of drawing a dramatic comic in a format I called Panel-a-Day. Perhaps you can guess how often it was updated. While I only made it to Page 16 (of an undetermined number of pages), and the story remains barely an introduction to an idea, there are a few standout panels of the almost 200 of which I reasonably proud. Here they are, in semi-random order! Holy smokes! I’d all but forgotten about this program until I stumbled across The CRPG Addict, a blog by an anonymous RPG nerd who’s tasked himself with playing every computer roleplaying game that’s ever been published, in order of release. (The site is an obsessive catalog of the peaks and lows in the evolution of a genre that’s existed since the advent of home computers, and continues to dominate today in the form of monster MMO games like World of Warcraft.) 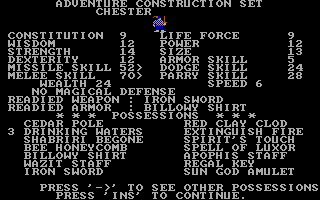 I wish the poor author good luck in his quest and thank him for reminding me of some of the most influential games of the ’80s, including Stuart Smith’s Adventure Construction Set. ACS was a curious thing. It was the first, most readily available set of tools for aspiring computer adventure game creators (after, I suppose, learning programming yourself). 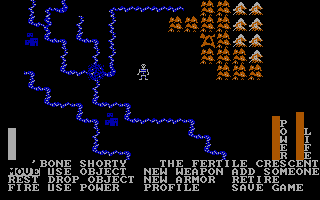 It was a game system built like the earliest graphical RPGs (think the original Ultima), and came with a couple of example scenarios along with lots of open-endedness for an imaginative person (me) to fill with ideas. Which I did. Many, many ideas. My impression of subsequent and more recent RPG toolkits is that they have become increasingly technical over the years, as the roles of game designer and programmer have converged and become most indistinguishable. But I hope the bar of entry to computer game design is not so high that only über-nerds end up making games (because only kids who write code can understand how games are made); young minds of all artistic and technical bents deserve a chance to be inspired to create, and sometimes all it takes is the right set of tools to set those minds in motion. I stopped posting examples of my Conspiracy! cards recently. Not because I ran out of cards, but because I ran dry of inspiration to describe them. What began as a simple exercise in sharing my design work had evolved into a daily writing exercise … which was great while it was working. But then, as all writers do, I ran into a block. Or, rather, a lack of clever ideas. So I stopped. I expect to recommence in the future. Inspiration is a fickle thing. Hopefully, it will return to me after a short absence with new tales to tell. Normally, the meetings of the game design group I organize in Portland are events I can reliably enjoy. This last get-together was going to be special: I’d worked hard over a long weekend to prepare my tabletop space empire sim for play testing. I was looking forward to showing the game to members of the group—all of whom are designers and experienced players capable of giving detailed feedback—and basking in the warm glow of recognition … not praise, mind you, but the recognition that I’d worked hard and the effort showed in the prototype I presented. My 4X space game, Transgalactic, is big and complicated and a little obtuse. No … it’s quite obtuse. It’s more simulation than game, to be fair. That is to say, it contains (so far) very few of the progressive and competitive elements that gamers crave, such as a scoring mechanism. It’s a system, to borrow a roleplaying term, waiting for campaign materials to be written for it. I did not anticipate this would be an issue with high-level players who also design what are often complex and abstract games. The game took a while to set up. I could have, perhaps, organized that better. Still, as I said, it’s complex. While I was setting things up, I tried to introduce my three players to general game concepts. Because the game’s mechanics are intricate, I thought it was important to lay out terms and explain components. Then, less than five minutes into my (admittedly awkward, being unrehearsed) explanation, one of the players grew impatient and interjected. “Let’s just start playing.” The others agreed. Things went downhill from there. My play testers thought they could intuit how to play based on experience with similar games. This might have worked if I hadn’t put so much effort into making this game different from everything else I’ve played. Everything was wrong and out of order. They didn’t know what to do on their turns. They asked a torrent of questions. I, being too polite to rein things in, got flustered. After 10 minutes, I had to call a halt. We weren’t playing my game; we were playing something else. I apologized for not being able to continue, promised to be better prepared next time, and collected my bits. My brain had locked up, and I couldn’t have continued in any event. It was disappointing. I was angry, embarrassed, frustrated. It felt like I hadn’t been given a chance to properly introduce these people, whose opinions I valued, to my creation. Two days later, I’m still trying to make sense of the experience. I’m guessing my testers saw familiar details and figured they could skip the introduction and jump right into gameplay, and I appreciate their enthusiasm. But I’m also let down by the notion that the intent behind my design—the fact that I was trying to do something essentially different from mainstream board games—was so easily dismissed. My game was conceived and has been constructed with more than clever strategy, competition, and victory conditions in mind; I’m trying to craft an experience. Maybe that sounds a bit lofty, even arrogant, but I’ve come to this place out of dissatisfaction with standard, single session games. They don’t quite scratch the itch, and I’ve been seeking a more engrossing experience. What itch? What are games, anyway, at least to me? Games have always played a powerful role in my life. I reflected on this in light of the play test debacle, and it struck me: games are a primary way I relate to others. From playing simple board games as a child with family, to playing Atari 2600 and computer games with friends, to creating wargames using G.I.Joe figures with my brother, to running Dungeons & Dragons campaigns in grade school, to writing my own roleplaying games in high school, to Playstation 1-3 and more computer games and Gameboy, to the current board game revival and mobile gaming … all of these have been a platform by which I share experiences with others. Not my only platform, mind you, but an important one. My attempts to create larger experiences are, in a way, an attempt at sharing deeper and more profound experiences with others. The ideal game, to me, should be a portal to another world where the out-of-game world fades from view and players craft a collective experience together for the time they share a tabletop. And while I tend to emphasize immersion (think roleplaying), I also place a high value on collaboration: competition is nice, but when the “losers” can say they had as much a hand in a game’s outcome as the “winners”, it’s a better experience for everyone. But here’s the rub: I haven’t been to this ideal place, this gaming nirvana, in a long time. I think the last time I felt fully engrossed in a game with other players was in high school, when I was creating entire worlds for players’ characters to inhabit and spinning tales for them to complete. Since then, less involved diversions have risen to the top of the tabletop market that was once dominated by D&D and its ilk. My design work is a quest, of sorts—a search for a path back to the sanctuary where imagination, shared with others, elevates mere play into something transcendent. I guess now the question is: can I still get to that place? I think so. But, a course correction is needed. I’m not discouraged enough to give up; I don’t feel obligated to redirect my energy to other things, and my commitment to designing and playing games is undiminished. But I’ve been taught a valuable lesson, I think: in front of any but the ideal audience, there will be difficulties presenting my work. Our meetup venue is raucous, and we were already well into the session. My schtick was unpracticed. The game is a jumble of board pieces and bits and esoteric nuances. So, there are rules to write out, vague points to clarify, player references to create, and a rules summary to rehearse. And because this game continues to evolve, it may be a while before I bring it to the table again. But I’m committed to being ready, when the time comes. Perhaps a dedicated venue (such as home) will eliminate distractions; perhaps setting up the game ahead of time will cut short the waiting that leads to impatience. In any event, the next demo will be better. And the next, better still. Useful feedback will be gathered. Perhaps even a small sense of pride in the time and effort I’ve put in will begin to grow. And maybe—just maybe—someone will enjoy playing it. That will be the true measure of my success. Thom doesn’t understand Space Ghost’s wife either. Perhaps my favorite installment of absurdist classic Space Ghost Coast to Coast. A brilliant incorporation of Björk’s whimsical nonsense and Thom Yorke’s wry bemusement into the unending car crash that is the life of Space Ghost. Tiny Edible Demons: bet you can’t eat just one!